Okmok volcano, located on Umnak Island in the eastern Aleutian Islands, Alaska, erupted explosively in July-August 2008 from vents within its 2050-year-old caldera. 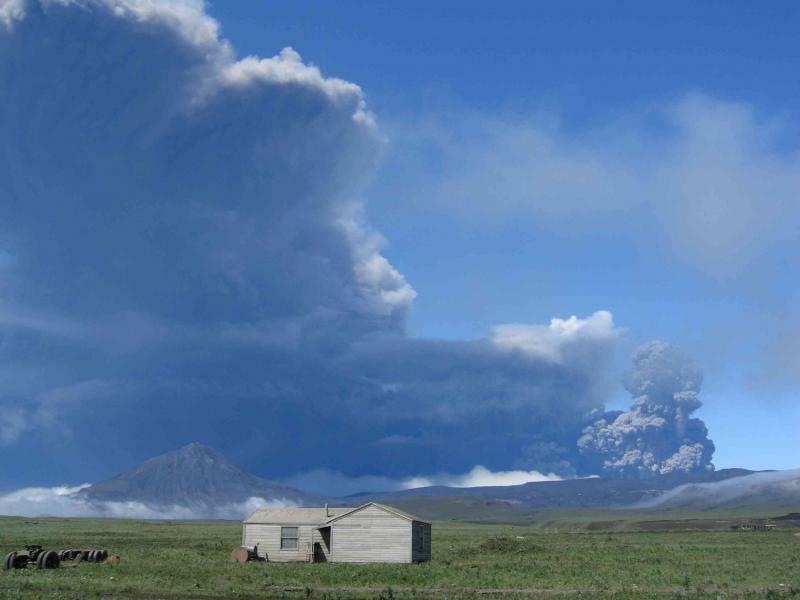 Water-magma interaction was an important process in the 2008 Okmok eruption, causing efficient fragmentation that produced large amounts of fine ash throughout the five weeks. This paper describes the stratigraphy, distribution, and grain size, shape, and composition characteristics of the deposits of the 2008 Okmok eruption. Understanding the production and deposition of fine ash in the 2008 Okmok eruption is important for hazard assessment during similar eruptions in Alaska and for the development of a better understanding of phreatomagmatism and violent mafic eruptions. Unema, J.A., Ort, M.H., Larsen, J.F., Neal, C.A., and Schaefer, J.R., 2016, Water-magma interaction and plume processes in the 2008 Okmok eruption, Alaska: GSA Bulletin, 15 p., doi:10.1130/B31360., abstract available here.